TRESemmé, the salon brand used by professionals, gives women salon gorgeous hair this holiday season at half the price with its TRESemmé Runway Ready Sale. Filipinas can get salon gorgeous hair at home, everyday as TRESemmé marks down their best selling TRESemmé Keratin Smooth shampoo and conditioner 440 ml bottle packs by 50%*! Infusing Keratin proteins unto every strand, TRESemmé Keratin Smooth helps control frizz for up to 48 hours. 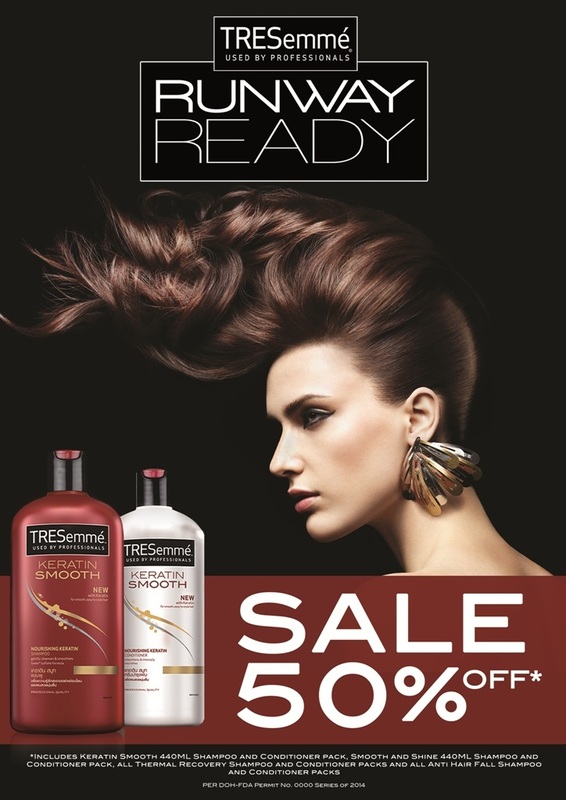 The TRESemmé Runway Ready Sale also includes their other variants: Smooth and Shine, Anti-Hair Fall & Thermal Recovery in 440 ml bottles, and Anti-Hair Fall & Thermal Recovery in 600 ml bottles. Promo runs until December 2014, so hurry and head on over to your nearest supermarket and department stores to avail of this limited sale. TRESemmé products are available in selected stores nationwide. **Based on SRP of shampoo and conditioner pack of selected SKUs only. Sale does not include TRESemmé Hair Mask and Styling products.